After navigating a field of 2,017 players over three days, Taylor Paur was crowned the champion of Event#18: $1,000 No-Limit Hold'em taking home $340,260 and his first WSOP bracelet. We started the day with 14 players and all eyes were on Phil Ivey, even as Paur was the chip leader. He maintained the chip lead through out most of the day only giving it up for a brief time in heads up play. Paur remained dominate as we watched the eliminations of Phil Ivey, Nick Colbrese, Adam Sanders, Robert Deppe and James Epner to get to our official final table. Just like the start of the day, Paur began the final table with the chip lead and put those chips to work early. It only took 13 hands to see our first eliminations when both Ryan Austin and Kyle Cartwright found themselves all in against Paur. 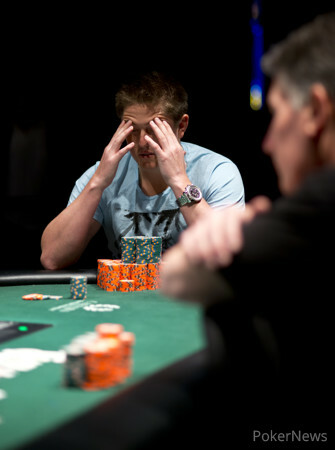 Austin started the hand with more chips and as such was eliminated in 8th and Cartwright in 9th place. The next person to go was Daniel Idema, in seventh place, just 10 hands later by DJ MacKinnon. Phillip Hui finished in sixth place after being pretty quiet during the day's play. He tried to make a move when action folded to him on the button but unfortunately for him, Alex Barlow in the big blind woke up with queens. DJ MacKinnon was our next casualty leaving in fifth place after he found himself all in with kings against Paur's aces. Following MacKinnon, was Alex Barlow in fourth place. Barlow was on the extreme short stack after MacKinnon and he doubled up Tai Nguyen a few hands earlier. Paur began three-handed play with a significant chip lead (5,000,000) over his opponents, Roy Weiss (745,000) and Tai Nguyen (475,000). 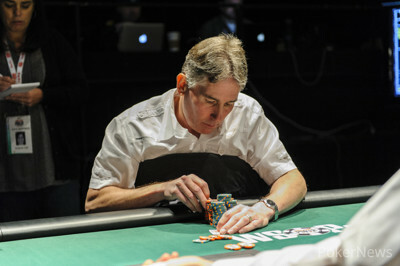 Paur continued to dominate play at the final table raising or reraising almost every hand. The only play Weiss and Nguyen had was to move all in. Which Nguyen did one time too many, leaving the tournament in 3rd place. Paur entered heads up play with a 4:1 chip lead over Weiss. Paur remained in control of the match until Weiss caught some lucky cards to take the chip lead for a short time. 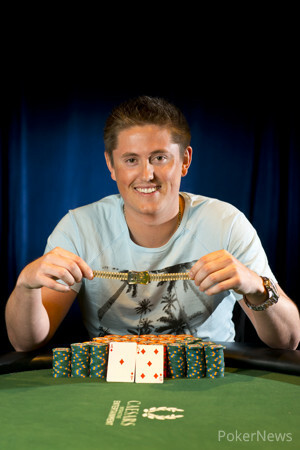 However, when the players went to dinner, Paur was back on top with 4,250,000 of the 6,000,000 chips in play. Weiss changed his strategy at dinner time and instead of calling most of Paur's bets, he began moving all in on every hand. At one point, Weiss took over the lead and had Paur all in for his tournament. Luckily for Paur, he won that hand and five hands later claimed victory over Roy Weiss, our second place finisher. That concludes our coverage of Event #18: $1,000 No-Limit Hold'em. Stay with PokerNews.com for all the latest coverage coming to you from the 44th Annual World Series of Poker. Hand 243: Once again, Roy Weiss moved all in and Paur made the call. Paur was already in front when the dealer put the onto the felt. As soon as Paur's rail realized their hero had paired his ace they erupted into raptures. The turn was the improving Paur to trip aces, and his rail went nuts! However, the noise soon lowered when everyone realised Weiss had picked up a club flush draw. The river was red, it was the and with that Paur had won his first bracelet and the noise from his rail almost lifted the roof off the Rio. Hand 238: Taylor Paur opened to 120,000 and Weiss repsonded with an all-in three-bet. Paur folded. Hand 239: Weiss pushed all in and Paur folded. Hand 240: Paur raised and folded when Weiss continued his strategy of moving all in. Hand 241: Weiss moved all in and Paur called. The board ran out to double Paur to 5,000,000. Hand 242: Paur opened to 120,000 and then called as Weiss moved all-in. Weiss snatched the lead when the flop came down and locked up the hand when the landed on the turn. The inconsequential fell on the river and Paur handed over 1,190,000 chips to his opponent. Hand #232: Taylor Paur folded and Roy Weiss got the walk. Hand #233: Weiss moved all in with and Paur called with . The flop came giving Weiss the flush draw. The turn came giving Weiss the flushd and the double up. The river was irrelevant. Hand #234: Paur folds giving Weiss the walk. Hand #235: Weiss moved all in and Paur folded. Hand #236: Paur completes the blind and Weiss checked his option. Weiss checked the flop. Paur bet 60,000 and Weiss folded. Hand #237: Weiss moved all in with and Paur called with for his tournament. The flop came and the cards are finally falling Paur's way. Hand 224: Taylor Paur opened from the button, Roy Weiss moved all in and Paur folded. Hand 225: Weiss open-shoved the button and Paur folded. Hand 226: Paur opened, Weiss moved all in instantly and Paur shook his head and mucked. Hand 227: Weiss pushed all-in and Paur folded. Weiss is up to 2,000,000 chips now. Hand 228: A raise from Paur was greeted with an instant all in bet from Weiss and fold from Paur. Hand 229: Weiss open-shoved yet again and Paur folded. "Are you even looking at your cards? I can see your eyes open but are you looking?" Paur seems to be getting restless, as is his rail. Hand 230: Paur opened, Weiss moved all in and Paur folded. Hand 231: Weiss open shoved and Paur folded. Roy Weiss moved all in from the button for 835,000 with and Paur called with . The flop came followed by the turn and river to give Weiss the double up. Hand #220: Taylor Paur moved all in and Roy Weiss folded. Hand #221: Weiss moved all in and Paur folded. Hand #222: Paur raised to 120,000. Weiss moved all in and Paur folded. How Did You Celebrate Winning Your Bracelet? As we wait to award another gold bracelet here at the World Series of Poker, here are some ways that pros celebrated after their WSOP victories... You know, just in case Taylor or Roy are seeking some inspiration. 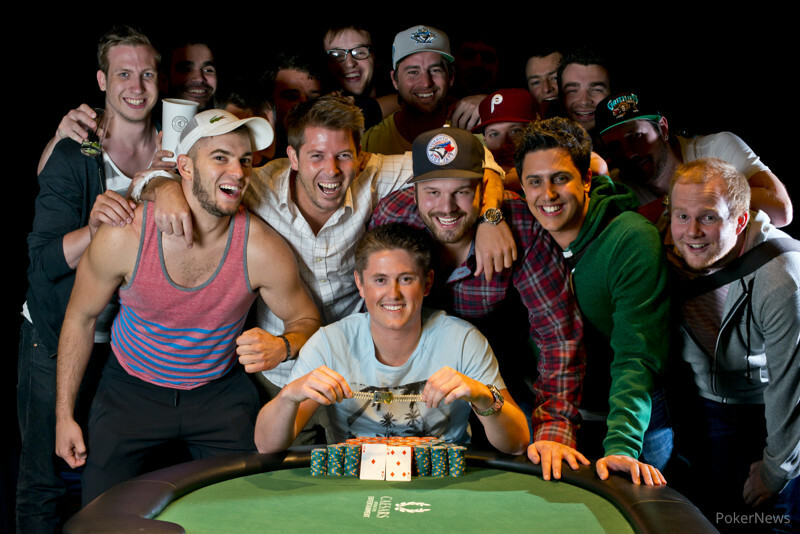 Taylor Paur celebrates with friends after capturing the WSOP Gold Bracelet in Event 18.